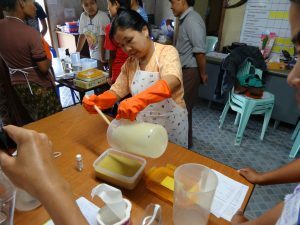 Farmer-to-Farmer volunteers, Marie Laurent and Robert Spencer, spent their time in Burma (also known as Myanmar) providing training on soap making and spa candles using bees wax to nearly 60 members of the Shwe Inn Thu Women’s Self Help Groups. They are an organization based out of Nyaung Shwe and include surrounding villages in Southern Shan State. 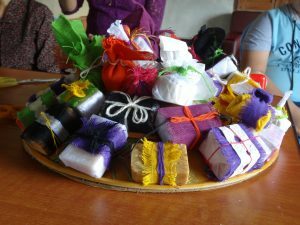 The activities on soap making included demonstrations and safety training, use of agro-products in the soaps, multiple hands-on trainings, enterprise budgeting, and marketing for disadvantaged women. Both volunteers and trainees identified and utilized locally available agro-products (vegetables, produce, etc.) as value-added ingredients in the soap production. Training in the village of Pauk Par Taung was very unique as the entire village lives and works in structures (houses, businesses, and restaurants) built above the water of Inlay Lake. It is more than just a sleepy fishing village, as many of the people raise vegetables on floating gardens and farm plots, and export the vegetables to nearby cities. Textile production (silk and cotton) is also prevalent in Pauk Par Taung. Year round tourism is very beneficial for this area, making for an ideal situation for production and sale of hand-crafted soaps and other skin care products. Cold-process soap making is a fairly common artisan skill practiced around the world. Ingredients include food-grade oils, sodium hydroxide (as an emulsifier), and the artisan’s choice of ingredients. One group was exceptionally enthusiastic when it came to identifying and utilizing locally available agro-products (seaweed, coconut, lotus silk, tomato, cucumber, water hyacinth and other aquatic flowers, herbs, etc.) as value-added ingredients in the soap production. 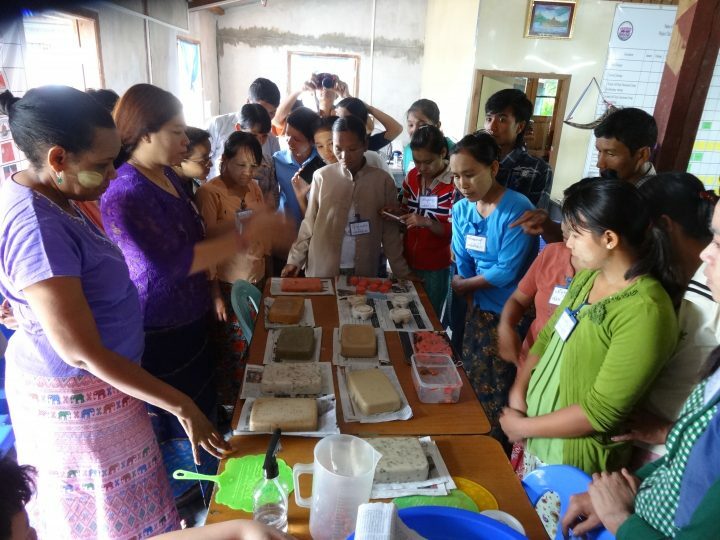 On the final day of training, the volunteers and participants returned to Nyaung Shwe where the groups learned about packaging and displays to enhance product marketability. They quickly caught on to identifying potential marketing situations applicable to their area. Each of the participants were given the opportunity to wrap and showcase their soaps and their creativity showed. Posted on August 12, 2016 by Program Associate, Samantha Williams. Interview with F2F volunteer, Neelam Canto-Lugo. Since 1985, the United Nations (UN) has celebrated International Youth Day as a way to provide “international support to improve the situation of young people” and focus on the issues that affect youth around the globe. Winrock’s USAID-funded Farmer-to-Farmer (F2F) Program in Bangladesh and Nepal engages skilled American volunteers to provide training and technical assistance to support youth entrepreneurship in the agriculture sector. In May 2016, F2F volunteer Neelam Canto-Lugo saw firsthand the direct impact that these programs can have on the lives of young people. Canto-Lugo heard about the F2F program several years ago from a colleague and former Winrock volunteer, and although she was anxious to volunteer herself, she patiently waited for an assignment that was the perfect fit. In Nepal, Canto-Lugo worked with the Women Development Advocacy Center (WDAC) to assist youth, women, and community organizers by providing training on technical proposal writing, career development strategies, and effective communication techniques. Canto-Lugo’s time in Nepal had such a profound impact on her that she returned home determined to raise funds and collect computers for WDAC’s digital literacy project, which provides computer training to economically disadvantaged women in the Dhanusha district and places them as teachers in rural schools. To date, she has raised $3,200, received a donation of three laptops, and is expecting additional laptops and funds in the coming weeks. Can you tell us about your experience working with WDAC in Nepal? I encountered the most dedicated and committed group of individuals who are enthusiastic and determined to find sources and strategies to improve the economic and social conditions of women and youth. The high school graduates and young participants were given an opportunity to brainstorm in small groups and describe their areas of need. As part of the training, they learned to write clear resumes, effective cover letters, and [participate in] mock interviews. They informed me that they had never before participated in a training where they got to present their views and issues. In the past, they were often asked to simply listen. In return, I was extremely impressed by their final written work and oral presentations. What did you enjoy most about your F2F assignment? I was most impressed by the eagerness of the participants to learn much needed soft skills and their desire to implement them in their work and personal lives. It was heartwarming to experience the enthusiasm they displayed to improve their lives and the lives of others. I saw a tremendous spirit of volunteerism among the youth who were kind, respectful, and willing to share their limited resources with others. The same respectful attitude, hospitality, and kindness was shown by the very delightful staff at the Winrock office in Kathmandu. Very rarely have I encountered such kindness and affection in the countries that I have traveled. I encountered so many young men and women who have become my lifelong friends. Why do you think it is important that we focus on issues affecting youth? In rural areas of Nepal, as in many nations, the youth are often at a disadvantage due to lack of educational excellence, technology, digital access, and employment opportunities. The trainees in my [teaching] sessions regularly expressed these concerns. They must be trained and made ready to compete with the students in urban areas and excel in job skills so they can fully participate in the modern world. What inspired you to continue your work with the host by raising funds and seeking computers for their digital literacy project? 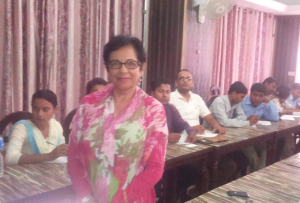 I was inspired to support the host by the sincere and enthusiastic response of the trainees in Janakpur and Kathmandu. I was overwhelmed by the altruistic attitude of the participants, many of whom were themselves facing very difficult situations and challenges. I was also moved and impressed by the incredible vision and undying dedication of Nanda Kishor Mandal, founder and director of WDAC, and Pradip Dutta, district coordinator in Dhanusha. [They] have been working tirelessly to bring hope and progress in the lives of the underprivileged in the Terai region. The fact that they selected Dhanusha instead of a more privileged area of Nepal speaks to their sincerity. They work day and night toward their goal in spite of limited resources. To learn more about WDAC and their work with women and youth in Nepal, visit WDAC.org.np. For more information about volunteering with Winrock, visit winrock.org/join-us/volunteer/.